YPSA and ABSA jointly organized a workshop on “Implementation of Tobacco Control Law in Noakhali” with the assistance of Campaign for Tobacco Free Kids and Bloomberg Philanthropies on 27th February 2017 at Conference room, DC Office of Noakhali. Mr. Badre Munir Ferdous, Deputy Commissioner and district Magistrate of Noakhali district was present as chief guest while Dr. Mujibul Haque, Civil Surgeon has presided over the workshop. The chief guest provided lots of directions and decisions in the workshop for implementing TC law e.g. to prepare a specific plan for implementing tobacco control law in the upcoming taskforce meeting to be held in March’17, to monitor the situation of pictorial health warning, tobacco advertisement and smoking at public places and take action accordingly, to operate mobile court once in a week, to take strong action by the magistrates for enforcing TC law, to arrange meeting with UNO, to arrange meeting with Bus Owner Association for ensuring the display of signage at public transport and to display no smoking sign in all government offices. He also requested all municipalities of Noakhali to take initiative for displaying TC messages in different public places for increasing mass awareness through leaflet, banner and poster. Mr. Md. Hanif, Former Member of Parliament, Professor Kazi Md. Rafique Ullah, Former Principle, Mr. Subrata Kumar Dey, Additional District Commissioner, Mr. Nurul Islam, Upazilla Executive Officer of Sadar Upazilla, Mr. Chowdhury Kamrul Hasan, Assistant Director of Narcotic department, Md. Jasim Uddin Chowdhury, Senior ASP and Mr. Md. Abul Kashem, Executive Director of ABSA were delivered their speech. 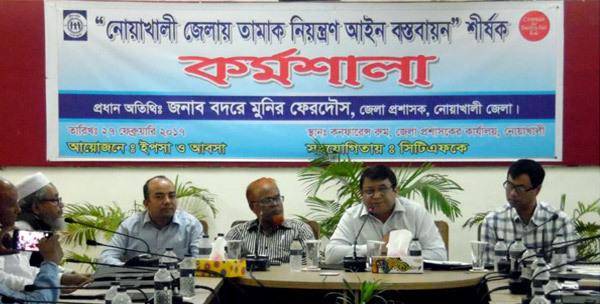 The district tobacco control taskforce members, authorized Officers, magistrates, journalists and representative of Noakhali municipality were the participants of the workshop. The main objectives of the workshop were to share Tobacco control law and Rules, share role and responsibility of authorized officer/magistrate/taskforce for implementing TC law in Noakhali.